A few nights ago my husband requested that I bake something. This almost never happens. He loves my baking, but usually his only request is to bake cakes without icing. For some reason he dislikes icing. I know, that's ridiculous. Just ridiculous. He'll eat almost any baking (as long as it doesn't contain raisins or icing). He's okay with a light glaze, but no icing. So, when he specifically asked for "a whiskey cake, please", I was surprised. And kind of irritated. He never requests anything, and then when he does, he chooses something that I am iffy on. I love booze. Yes, love it. But I feel like it is not welcome in my baked goods. What a waste of good alcohol. To me those are two worlds not meant to collide. Rum chocolate balls that everyone makes at Christmas? Yuck. 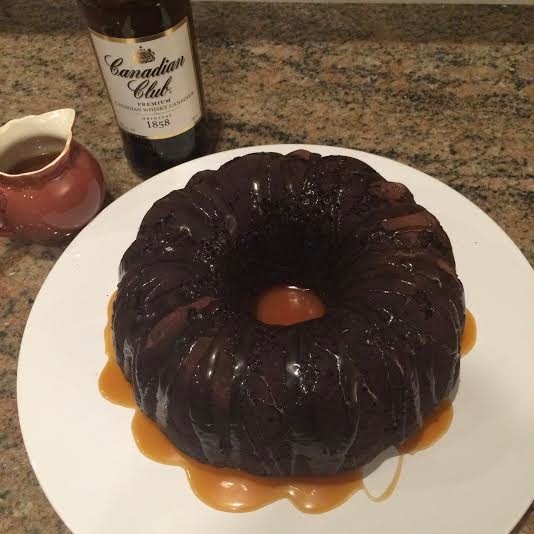 Rum cake? Sick. Irish cream cupcakes? Gag me. Of course I agreed anyways. Thank goodness for Pinterest. Within just a couple of minutes, I found a cake that looked pretty. The chocolate component of it made me willing to give it a whirl. And there was a caramel sauce that looked like a challenge, so why not? Let me just say that I am so so so glad that my husband suggested this cake. It was so rich and chocolaty with just a nice warm hint of whiskey to warm your throat after each bite. DELICIOUS!! Here is the link to the original recipe, from loveandoliveoil.com. I didn't change much at all, other than using light buttermilk (which was weird to me, as I didn't know you could even buy different fat contents of buttermilk until I noticed it when I got home). I used Canadian Club whiskey because it was the first one I found in my cupboard. I realize that Canadian, Scotch, Irish, Tennessee and Kentucky whiskeys are all quite different, so I guess one could experiment with all kinds. I've never tried any recipes from this site before, but if this is any indication of the awesomeness of the others on the site, then I need to make them all!!! Also take note that you don't need to use a mixer for this one as the original recipe suggested. I just used a whisk and it turned out wonderfully. It seemed like such a quick stir that it wasn't worth dirtying the beaters. The caramel sauce was a little bit of a challenge. The first go round, I took my sugar off the heat and stirred in the cream too early as I was paranoid about burning it. It ended up weak tasting and kind of a yucky yellow color. I gave it another go and am glad I did. Be patient and wait until you have a deep amber color. The flavor is so much more robust and it's just a beautiful golden brown. Here's the end result. I wish I had a picture of this plated with a nice scoop of vanilla ice cream and more whiskey sauce drizzled on top. I always forget to take a picture once it's plated....I guess I was just too focused on eating it. This is a keeper FOR SURE. It doesn't happen very often, but I was wrong in this case. Whiskey belongs with chocolate cake. Definitely. FYI : If anyone is as nerdy as me when questioning the spelling of something, take a look at this article (re: does one spell whiskey as "whiskey or whisky?") It's an interesting read.